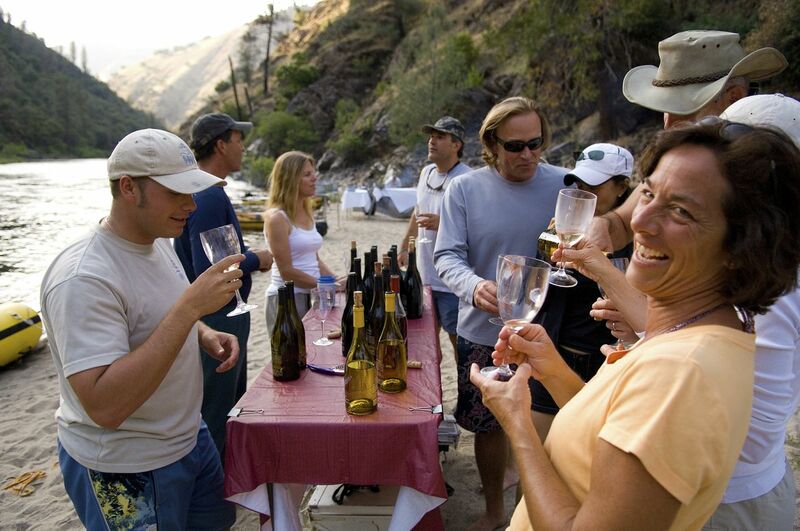 O.A.R.S.’ Wine on the River Series pairs vineyards and gourmet presentations with multi-day rafting expeditions. Due to popular demand, veteran outfitter O.A.R.S. has announced a second departure of their six-day gourmet wine tasting trip on Idaho’s Middle Fork of the Salmon River Sept. 5–10. After selling out the company’s scheduled departure on Aug. 27, this brand-new trip combines world-class scenery and renowned whitewater with chef-prepared gourmet meals, award-winning Idaho wines from Ste. Chapelle Winery and blue-ribbon trout fishing. Chef Eric Conte from Gnosh restaurant in Moscow, ID, will return for his second trip of the season with O.A.R.S. with a locally focused and seasonally minded menu. Conte is Idaho-raised and takes pride in using the ingredients and products that grow in his own backyard. The Middle Fork of the Salmon River in Idaho is the flagship program in the company’s season-long Wine on the River Series. The per person price for this trip is $2,282 and includes a scenic flight to the river, six days of rafting and five nights of comfortable camping, professional river guides and fishing guides, all rafting and expedition equipment, dry bags for personal gear, fresh and healthy breakfasts and lunches plus chef-prepared gourmet dinners and an assortment of Idaho wines. The trip begins and ends in Salmon, ID. They were blown away by entrees of grilled Idaho trout with wild blackberry/nectarine salsa, Rocky Mountain Elk steaks with zinfandel demi glaze and caramelized shallots and more complemented with appetizers, side dishes and desserts such as Dutch Oven apple crisp with cheddar cheese and crème anglaise. “That the chefs were able to produce this kind of food in the middle of nowhere is astonishing to say the least, and we are pretty accomplished foodies. Five stars in every way!” they added. Other Wine on the River trips pairing choice vintages with river adventure and remarkable cuisine include a three-day/two-night Aug. 12 departure on California’s Tuolumne River featuring Boyle MacDonald Wines and Chef Chip Roberts at $949 per person; and a five-day/four-night departure on Sept. 14 on Idaho’s Snake River through Hells Canyon (the deepest gorge in North America) with Foppiano Wines and Chef Aaron Woo. The per person rate is $1,695 and this trip also includes a scenic flight from Lewiston, ID, to Halfway, OR, with spectacular views of Hells Canyon below. O.A.R.S. has been providing whitewater rafting vacations since 1969, handling some 500,000 guests. Over the decades, the company has set the standard in first-class rafting, sea kayaking and multi-sport adventure, with destinations and unparalleled experiences on over 35 rivers and coastlines around the world. O.A.R.S. caters to active travelers of all ages and abilities with more than 75 itineraries, including one-day and weekend escapes. In 2013, for the seventh consecutive year, Condé Nast Traveler recognized Mindy Gleason, O.A.R.S. Reservation Manager and International Adventure Travel Consultant, as Condé Nast Traveler’s standalone Top Travel Specialist in the River Rafting category. In 2013 Outside, America’s leading multimedia active-lifestyle brand, named O.A.R.S. one of the top two outfitters in the world in its annual Active Travel Awards recognition program. For more information, availability, reservations and a copy of the 2014 O.A.R.S. Adventures catalog call 209-736-4677 or 800-346-6277, email info@oars.com, or visit: http://www.oars.com/. This entry was posted on July 24, 2014 at 3:20 pm and is filed under adventure travel, culinary travel, food & wine, river rafting. You can follow any responses to this entry through the RSS 2.0 feed. You can leave a response, or trackback from your own site.